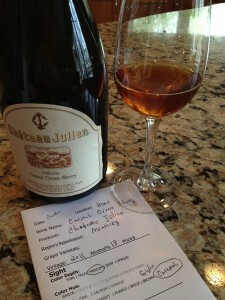 The first time we went to Chateau Julien was in 2011. We were going to my friend Kevin’s wedding in Monterey California over Easter weekend. Chris and my son Andrew with his friend Troy flew out and joined me earlier in the week as I needed to do some work in California. While I was working Chris and the boys spent a day in San Francisco and saw some of the sights. Friday morning we packed up and headed down to Monterey. We arrived at our hotel around 11am and got settled in. We let the boys hang out and check out the area around the hotel and we headed out with Cynthia and her husband Dan to check out some of the local wineries. The first one we went to was Chateau Julien for a tour and tasting. Our friends John and Laura met us at the winery too. The tour was very nice and we were able to taste some of the wines. After the tour, our guide had a bottle of the Carmel Cream Sherry for us to taste. 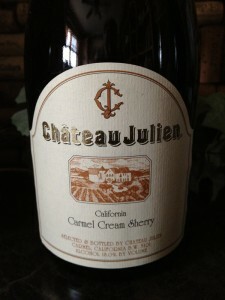 We enjoyed the Carmel Cream Sherry so much we bought a couple of bottles and brought them home. We also purchased a bottle and hung out in their garden area for a few hours. Turns out, we never did go see another winery that day! 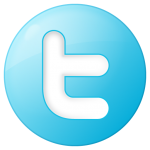 Moving forward to Easter 2012. Chris and I decided to host Easter with my family. We also invited Dave and Heather who are close friends and will be heading to Napa with us in May. Easter day was very nice. the weather could not have been any better. It was sunny and in the upper 60’s. We decided to cater to the adult kids and Chris made homemade Mac-n-Cheese, grilled hamburgers, and chicken. My sisters and parents brought some salads to help with side dishes. We had plenty of deserts. I know our lunch menu was not traditional, but why not start your own family traditions? I can tell you the meal was a hit with everyone. After we ate lunch everyone was just sitting around watching baseball and visiting. I had decided a few days earlier I was going to grab a bottle of the Carmel Cream Sherry and share it with everyone. As I opened the bottle Dave immediately was the first one in line to have a small glass. I poured a few more glasses and shared them with my family. Tammy, who is a beer drinker did not really care for the Carmel Cream Sherry. I am still trying to find that bottle of wine (besides Boone’s Farm) that Tammy will like. Some of the younger adult kids liked it and so did my sister Melissa. Of course Dave, Chris, Heather and I all enjoyed the Carmel Cream Sherry. Dave sipped on a couple more glasses before he headed home that day. The color depth was medium. 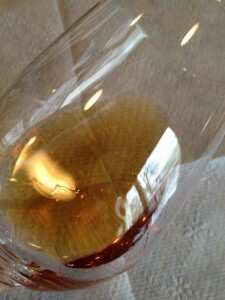 The actual color of the sherry was golden brown to a caramel hue. The Sherry was very clear. Smelling it I noted that it was very aromatic and it showed medium age. We could really taste caramel, butterscotch, and hazelnut. The tannins were week. The finish was smooth and long. I would rate the Carmel Cream Sherry three glasses.